Hmmmmm. 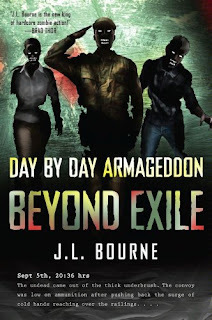 Did I enjoy this book as much as it’s predecessor, Day By Day Armageddon? Short answer: No. Long answer: also no. Shall I elaborate? From a technical standpoint you have to concede that Beyond Exile is Day By Day’s superior. Technically. A lot of the “flaws” of the first book are absent here. The problem is, as you may have guessed by my quote marks. Is that I never thought of Day By Day’s flaws as, well, flaws. Did the plot tend to meander, which sudden narrative events coming out of nowhere? Yep. Was the majority of the action described to the reader after it had already happened? Yep again. But as I said in my review of that book, these things gave the novel a uniquely authentic feel. The plot and structure did not adhere to what one would expect from a novel, and as such the book felt like a genuine diary, instead of a book in diary form. This, for me anyway, lent to the book a level of suspense that it might otherwise have lacked. Beyond Exile, however, reads like somebody took Bourne aside and explained that if he was going to be writing books then he’d best start learning the rules. The result feels very forced. Day by Day meandered, yes, but it felt natural, things happened randomly just like they do in real life. But Beyond Exile has a rather more structured plot, and when reading the book you can feel the author pushing his characters here and there. This neatly robs the book of the genuine diary charm, and without that the story definitely suffers. And despite all this talk of structured plotting, I actually doubt that Bourne sat down beforehand and plotted this book out. Obviously I don’t know how it went down, but I’d bet money that both books were written in one go with no structured plan, but with Day by Day he was maybe ignorant of the “rules,” and with his sophomore effort a little bit too aware of them. For example, early in the book a metric crap tonne of new characters (metric crap tonne being the academic term) are introduced and through a few highly coincidental plot twists our still unnamed narrator is put in charge of all of them. But you can practically hear the cogs turning in Bourne’s mind, realising that a man in command of many lives, who orders others to go do dangerous things instead of doing them himself, maybe isn’t the best POV character. But instead of rewriting the plot, he just twists it around until the problem is solved. As I’ve said already, it feels very forced. But the book is not wholly flawed. A new character is introduced who I found very interesting, an Arab man who teams up with our Hero. Bourne skilfully toys with the reader, making us wonder “is he a terrorist? Isn’t he?” Which, I know, sounds like is could be awful and more than a little offensive, but works really well. I also like how the Hero’s relationship with a character from the first book develops into more, but almost entirely off screen. It gives the impression that there’s a lot more going on in his life than what he puts down on paper. The ending? Pretty much as non existent as the first, neatly setting up the third book. Will I be reading that book? Yes. But I hope that Bourne develops a little confidence in his writing to write what he wants, and all “rules” be dammed.